It was over 10 years ago that I was in charge of getting publicity for Samsung’s then charity,”Four Seasons of Hope.”The event was a month away and I couldn’t get a word written about it. I took a long hot shower (my best think tank) to come up with an idea that would cause media mayhem. I immediately called the marketing executive who I reported to at Samsung, Peter Weedfald, and his co-creator of the event, Susan Grant.They both gave me their support but warned me that the PR better match the donation. Just telling the press that Clinton was going to show got a lot of interest, but was not getting me the camera crews and gossip press. I took my plight to columnist Andrea Peyser of the New York Post who put her own spin on the story that turned out to be one of the most sensational PR campaigns that I was ever involved with. When Andrea learned that Clinton was going to be in the same room with Rudy Giuliani (she claimed that at the time they were at war with each other) she ran a picture of them nose to nose on the front page of the Post with the headline, “Faceoff!” The story was all about how Giuliani had been at the event for a few years and now Clinton was attending to possibly steal his thunder. Every TV station, newspaper, magazine, wire service, radio and freelancer showed up to witness the encounter. The event turned out to be SRO, standing room only. The press was hanging off the scaffolds that were built for them. Clinton and Giuliani did not disappoint. Being the politicians they are, the stars both walked on stage from opposite sides and embraced in the middle. The crowd went wild. We once again made headlines everywhere. Ever since then, I have had a special relationship with Clinton that he too admits was built on sweat, passion, and trust. The Samsung people now have a solid relationship with Clinton and I believe I was responsible for it all. I never hear from Weedfald even though we shared career thrilling milestones together. Susan Grant continues to be one of the greatest event producers ever to grace this earth and stays well connected to me. This entry was posted in digital, senior lifestyle, tech and tagged Andrea Peyser, Bill Clinton, International CES, Rudy Giuiliani, Samsung by loiswhitman. Bookmark the permalink. That’s really cool. I’m still embarrassed that our nation was put through the whole Monica thing, but I have to admit that Clinton has really had a marvelous post-Presidency career. Clinton was an embarrassment for a while but he rose above it and became a better President and continues to be a good leader for our country in many capacities. Good share, Lois!!! You have rubbed shoulders with many people who significantly have made a difference because of your efforts. Sometimes being in hot water is a positive thing…..your think tank!!!! 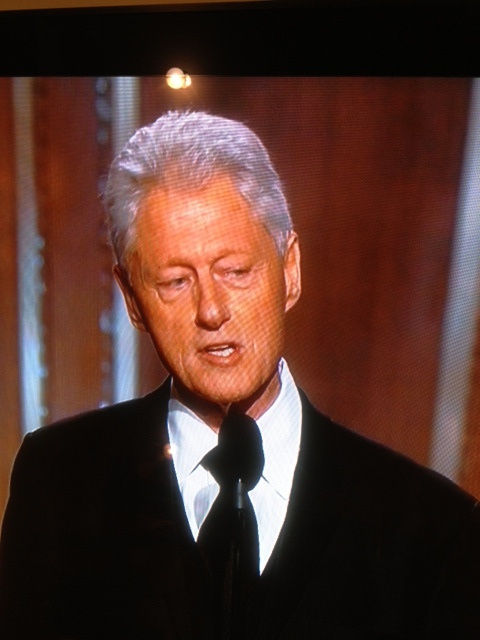 Go figure…i never watch the golden globe awards except for last night. Bill Clinton was the pix thar caught my eye. You may be a Democrat or a Republican but you cannot deny what a great impact he has had on all of us. And….he lives in my town! Yes…ask Todd. We see him in Starbucks from time to time.